uAttend MN2000 - Starting at $219.00! - ID Badges Unlimited Inc. Unlike a traditional time clock that is tethered to a computer and client based software, uAttend uses cloud computing to allow business owners the flexibility of doing time and attendance anywhere and anytime. 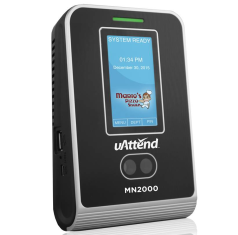 Additionally, the system allows extreme flexibility, letting employees punch in and out from the time clock facial recognition and RFID proximity badge terminal, as well as from PC web browser and smartphone app. Lifetime manufacturer warranty and support at no additional cost. Unlimited Departments: Separate and segment employees any way you like! Who's In Board: See your work force status in real time! Much, much, more: Online system means new features and upgrades are easily added to the system! IMPORTANT NOTICE: Extremely affordable monthly subscription fees are required to use uAttend Employee Management Systems. uAttend Time Clocks will not function without a subscription. No contract required.